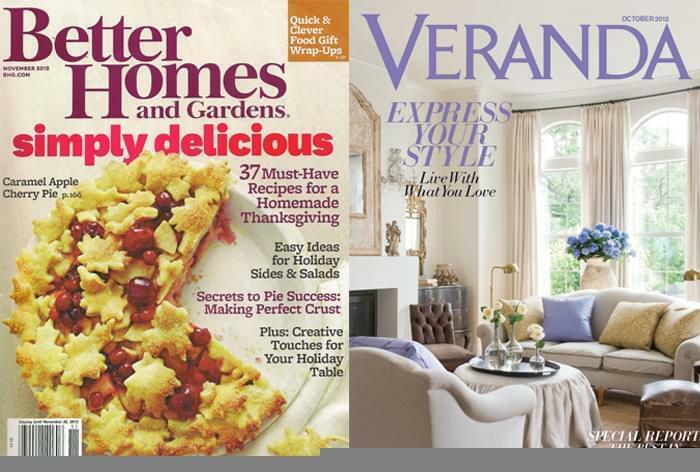 Two Houston based designers' homes were recently featured in Veranda and Better Homes and Gardens. Lesueur Interiors founder, Meg Longeran's heights Bungalow took front and center in Better Homes and Gardens November issue. It's always a treat to see what designers choose for their own home and Meg's house was not a let down. Meg's beautiful living room. I love the Ikat chair fabric- which is Lee Jofa. She pairs these chairs with a baker sofa and adds custom seagrass and custom drapes. The iron coffee table is from Heights Antiques on Yale. In Meg's dining room, she uses a beautiful Matt Camron Antique Heriz. The antique armoire is French from the 19th century. The dining table top is made from reclaimed cypress. Last but not least, the master bedroom- where Meg layers an antique khotan on top of wall to wall seagrass, which adds interest to the floor. She flanks the bed with a pair of antique French chest. Bedding and drapes are custom. The other Houston designer is Jane Moore. Jane's Houston town home was the cover of Veranda's October issue. Jane mixes Swedish and French antique with a neutral color palette to create a beautiful and subtle home. Jane's living room and the Veranda cover is perfection! One of the most interesting rooms in Jane's house is the kitchen. Part of the kitchen counter is a 19th century architect's desk. 19th Century Swedish table is from her own antique shop, Jane Moore Interiors. In Jane's bedroom, she uses wall to wall seagrass, lace and linen to create of combination of textures. The result is soft but interesting.